1. City, mentioned together with Babylon, Erech, and Accad as forming part of the Babylonian kingdom of Nimrod (Gen. x. 10). The exact site of Calneh is unknown. 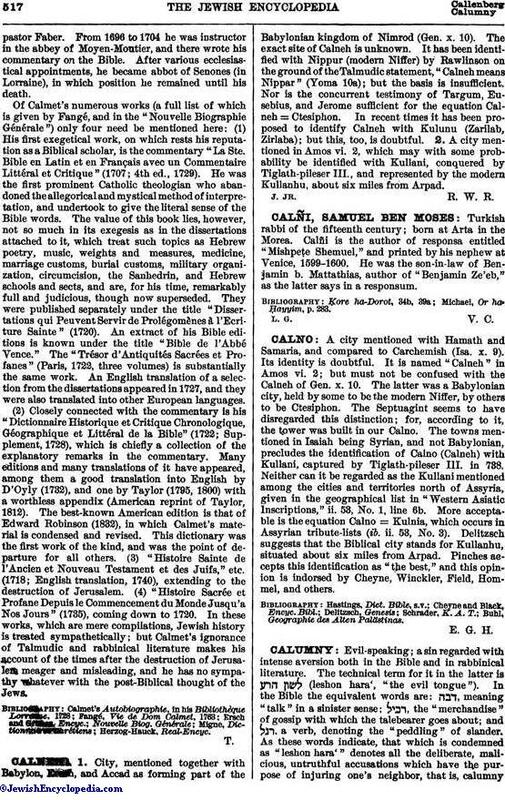 It has been identified with Nippur (modern Niffer) by Rawlinson on the ground of the Talmudic statement, "Calneh means Nippar" (Yoma 10a); but the basis is insufficient. Nor is the concurrent testimony of Targum, Eusebius, and Jerome sufficient for the equation Calneh = Ctesiphon. In recent times it has been proposed to identify Calneh with Kulunu (Zarilab, Zirlaba); but this, too, is doubtful. 2. A city mentioned in Amos vi. 2, which may with some probability be identified with Kullani, conquered by Tiglath-pileser III., and represented by the modern Kullanhu, about six miles from Arpad.